props to Kahunapule for the picture. 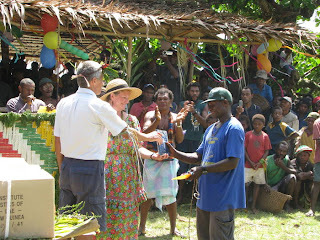 This is a picture taken at the Lote New Testament Dedication. Only the people decided to call it a Launching. Launching is a great term, because it means that receiving the Word of God is the BEGINNING of something big. On the left, the cardboard box is one case of Bibles. The bamboo cover behind that is decorated with 'bilas' or decorations. The people are gathered around to watch the presentation. The man in the blue shirt was key in translating and is VERY happy to see this. The ex-pats on the left have been here for over 2 decades working on this. The man in the back with the whitish skirt (laplap) on is overwhelmed with joy at this occasion. This picture, is a symbol of 23(approx) years of hard work, intense relationships, spiritual struggle, and teamwork. I have been told by a friend who was privileged enough to be there for this occasion, that they've been to many dedications over the years, and THIS was THE one to be at. The people were so in tuned with what God wanted, and so excited to be receiving HIS Word. Feb 4 there will be another dedication. THIS WEEK! THIS YEAR there are planned to be 10!!! TEN DEDICATIONS... TEN completed New Testaments! TEN languages to receive the Word of God. I learned something new today about PNG culture. They are naturally multiplex relationship oriented. Simplex would be the typical American. We usually relate to people in 1 way. Seller/buy.. employer/employee. Multiplex would be if you were working with your friend. Now you're friends AND co-workers. Or your brother.. brother/co-workers. Westerners tend to isolate and keep things simplex. You hire someone to do a job. You don't necessarily bond to them in other ways. Papua New Guineans naturally are multiplex. So they can't help but try to establish as many ties and bonds to you as possible once an initial relationship is created. Today that became true as a man and his father came in to get their hf-email working. I spent ten minutes working on it, and fixed it. Then the next 20 minutes we talked about his work, and his father, and his father's father. I met his dad, who has been in Bible Translation since 1956. I learned about his brother who stopped working in translation, and his grandfather who was working in it. How he is a third generation translator. He thanked me for my help and told me what a blessing I was. And we talked and talked, until it was time to go. I enjoy that. I felt honored first that he would let me get to know him like that... because for us, who simplex relate... he was a customer, I was cordial to him, but we were also co-workers... to him, to NOT relate like that would be a chore. To me, relating like that takes energy. It is a subtle but very interesting cultural difference. At times it can appear clingy or needy to us, but if we embrace it, we can really be blessed by getting to know people a lot more deeply. Even with the ex-pats here on centre, we have multiplex relationships as we all live, work, eat together in the same environment. I find this a huge blessing as it seems more close to what God intended. Daily I have fewer one-touch relationships. I very rarely have the 30 second interchange with someone, like a cashier at a store. I stop, greet someone by name, ask them how they are and so on. It is an interesting and stretching part of living here, because the flip side is that it very very hard to remain anonymous. Each passing year you get to know people just a little bit better. And for those who don't enjoy being 'known' it is a challenge. Me however, I enjoy slowly sharing some of my talents and skills and using them. And I enjoy getting to know people closely. I heard once that many people feel their college years were the closest relationships they ever made. I still believe that, but I can see myself in the future, comparing this place to college in terms of relationships. I'm considering starting a new part of the blog called 'Movie Reviews by Alice'. Alice is a PNG friend of ours who works with my wife in the preschool as an assistant, and also baby sits our children. Part of the relationship building in this country is sort of a back and forth dependency. She relies on us often to help her with school fees, or seeds for her garden, and we have her help us out in trade with babysitting for us during Bible Study nights. It has become a tradition for us to pick out a movie for her to watch after the kids go to bed. We often pick slapsticky type G rated films that she seems to enjoy. Somehow as a part of this, as I drive Alice home from babysitting, she gives me her review, as I'm always interested in finding out her thoughts. She speaks some English but is more comfortable in Tok Pisin. It is always fun to hear her reviews of the movies from her perspective. This week she watched "UP". Disla lapun man em i wokim balloon nah haus bilong em roun roun. Em funny movie. This old man tied balloons to his house and made it portable. It was a funny movie. It's fun to hear Alice laugh, she's got a good laugh, even when life isn't treating her well. The heavy rains here have been ruining her garden, which to her is an important source of food for her family (she is a single mom), as well as income if she sells at market. But she said, (translated) 'Tomorrow I hope it doesn't rain, but if it does, I won't complain because God is in charge, and my complaints won't change that." We try to be careful what movies we show Alice for fear of giving her the wrong impression of America, but we also enjoy sharing something of ourselves with her and hearing her reaction. If you think hearing movies by Alice would be fun, I'll throw in a review when I get them. And now for a brief word from the not-exactly-glamorous part of our lives. This last 7 days have been a constant bombardment of bad news. The kind of bad news that hits you pretty deep in your soul and makes you very sad. As we prepare months in advance for furlough our minds have begun a transition from here to home. We see furlough as the light at the end of this 6 month tunnel. This tunnel where our jobs are getting harder, and bad news is coming more frequently. While in this tunnel our attitudes are under challenge because we do tend to find certain things harder to cope with than they used to be. When you move here you have the honeymoon phase, then the life as normal phase, and then the furlough phase. Between each one is a transition that sort of focuses on the negative aspects of where you ARE and the good aspects of where you're GOING. We had something similar when we transitioned to HERE. Our jobs are busy, and hard. This last month and the next 5 are going to be very hard for both of us. We're both in positions where we are vital as are many people here, and as such, there are pressures. One of the pressures is whether or not there will be people to fill our holes when we go on furlough. This week EACH and every day for the past 7 days has had some new very discouraging news, that somehow makes it harder to get through the next 5 months. Kendal and I have spent some major time in prayer asking God... to lead us. It's no point in going and pushing against the flow if the flow is God's direction. We need His guidance here... and we know there will be resistance from the enemy and there has been. Kendal found out last night her grandmother is in the hospital. This morning I found out yet another co-worker may not be returning. We can't continue to lose the wind in our sails like this... we need some sort of hope. The two of us have this ... feeling that the next several months might be a dark time of trial for us, and we have begun shoring up against it. If you want to join us in prayer please do. The list of concerns on our hearts is almost overwhelming because we have absolutely no control over it... we need God to provide in great ways. -house rental - will they find a renter for our place for only 6 months? -pet details - who will watch our dog? -kid details - how is this going to emotionally and educationally affect the kids? -furlough schedule - what will we do? where will we go? is there a lot of flying and driving? Where will the money come from? We really have so little we can control. We have seen God provide time and time again, and we know it is because you, our partners in this ministry, have been going to Him in prayer on our behalves. We have in turn been asking God to bless you all financially, health-wise, and family wise... because we know things are tough on you too. Thank you for taking the time to read our hearts here. Amidst everything going on, God is doing some neat things here. The Scripture use conference, another New Testament dedication last month, some very good things among the people of PNG. We're glad to be a part of it. And will continue to be a part when we're on furlough as well, even if our part is in telling everyone the many things that are happening over here... face to face! anyway... as I did this he became more convinced that his computer was having a problem and rebooted. Here is the transcript of our conversation... it had me laughing for a good couple of minutes. 11:28:52 AM VICTIM: dunno, what do I do? 11:34:29 AM CHAD: yeah well the one letter at a time thing was me pulling your leg. 11:34:36 AM CHAD: sometimes we techs need to have our fun. 11:35:03 AM CHAD: yeah... sure. 11:35:08 AM CHAD: well either way, it gave me a good laugh. One of the things I've discovered in the past 3 years is War history. I've always been interested in the history of wars, but living in California rarely was confronted with it. When we spent some time in North Carolina we were confronted with the Civil War, with statues commemorating and really being much closer to it. 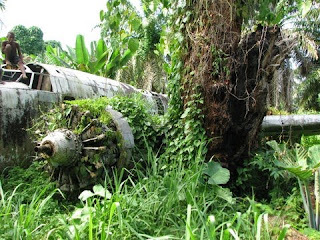 In PNG however, you run into war relics quite often. 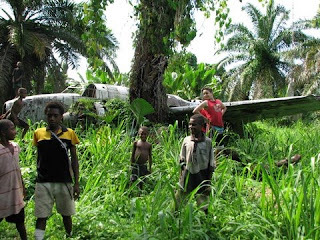 The above is a B-52 wreck that some of my friends photographed (I haven't seen this one in person) in Talasea near their village. Until the late 60's this wreck was pristine. It's been decaying more as scrappers have gotten to it, although the local village tend to try and keep that from happening as this is one of the most pristine wrecks and an attraction to others to come see. negative, and crossing Open Bay, the flight passed over Kalai Plantation. been destroyed in previous missions. They attacked a tug boat. March 6, 1944, The US Marines lost more men to treefalls than to battle. was bombed by friendly planes on March 27th, and killed 5, wounded 18. This week, we (our organization) were privileged to have hosted a Scripture Use conference that was attended by many PNG church denominational leaders. It was very encouraging that we were able to have this gathering of many church leaders from all parts of the denominational spectrum that wouldn't normally have had much cause to be together. It was good hearing what the church leaders had to say. Please pray with us as we sift through all the notes and feedback, determining what happens next. We don't want this to be a one-off event. We want this to be the beginning of a long positive relationship. It has been raining and windy here, I hear that's true about the U.S. too. Work for me has been REALLY busy... but this week the light at the end of the tunnel has gotten a bit fuzzy as we're not sure if I'll have relief come June. -We want to leave June 21... pray that this is a possibility. -We need someone to fill in our spots while we're gone. So far I have no one to do networking while I'm gone, which is a VITAL service to the organization. My dept is losing a LOT of talent this year. I need help, and new recruits typically take 2 years to get here. There are none on the horizon. So at the moment I'm looking at a very long period of doing this job alone. -We still need all the amenities for furlough: HOUSE, CAR, funds, more partnership support. ETC. -PLEASE pray that we can raise our support within the time frame allotted. IF we have to stay in the U.S. because our funds are not at 100% then there will be a LOT of problems due to our not returning in January. So please pray for that. IN short, furlough is meant to be a break from the norm here, but everyone tells us that your first furlough is VERY hard. The tentative plans we have (nothing in stone yet which tends to be hard to bear if you're planners like we are) seem so busy that we'll return to the country in January all tired out. You can pray we get some much needed rejuvination as well. Thank you and keep praying! In November I became the only guy in the network room. Last week we lost our main phone guy. I am currently doing the work of 4 people. But this is a common ailment here as staffing declines. When staffing gets low like this, we can't make forward progress on projects and simply try to maintain the services at a slower rate, that we currently offer, instead of trying to implement anything new. Unfortunately, licenses expire, software needs upgrading. TODAY marks the last day in a month long project... well actually 5 projects. In a month with a 1 week break, and being short staffed, I have completed 5 large projects. I have been very busy. I have worked late every night this month, and I've neglected much of my daily responsibilities in order to make it happen. Here is why I'm excited. For a LONG time people have wanted a guest network that people who come and visit can use, but we haven't had the infrastructure. We have researched it and it would have cost us over $3500 to implement. Then one morning I woke up and had an idea. I tested the idea, hit some obstacles, thought a way around them... and after many hours of testing and problem solving, was able to implement this new guest network in 3 locations for under $100 each. Not $3500, but $300 !!! It meant I had to hustle, and get it done well and quickly. But today was my last installation. I not only installed it but documented it and created video training. What this means now is that people who come to visit and help with construction can get their email. AND the old method of them having to go through our helpdesk is unnecessary which means that I've made it easier for EVERYONE involved. THIS IS EXACTLY the type of project that I'm here to do. The kind that makes technology work for us, helping reduce the work load on our already overworked staff. (for geeks, I dug up a handlink wg-602 wifi hotspot, put it in front a dslam and put dsl modems on locations with WIFI opened SSID.. so I turned 1 wifi hotspot, into an unlimited amount of wifi hotspots, while simplifying the procedure to get online, and reducing the need for network equipment (no more firewall for this network). Well because I'm alone here, I can't really express to anyone how excited this makes me, but, I am excited. So... now I'm hoping to get to this huge list of back work that I have let pile up in order to finish those 5 projects. I even got a kudos from my manager "while you were alone I didn't expect any kind of forward momentum. Good work." I do think however that knowing we go on furlough in July is enabling me to work a bit harder and longer because I know that if I do burn out, I'll have a visit back home to help me recover. We will furlough in July of this year for 6 months and need to find a place to stay and a car to drive. If creepy crawlies make you squeamish, you might not want to read this post. Last night around 10:30 I get myself ready for bed. It has been raining very hard for several hours and the ground around our house is a swamp. As I lay in bed I let myself hear the sounds of living here. Some new sounds struck my attention. As the rain comes down for a prolonged time, and the moon is out, more sounds come out. It was very much like one of those rain forest sountracks you hear. The frogs were singing their little tunes in harmony, the rain hit things. And then I noticed the rain was pouring out of our water tank.. overflowing. The overflow drain had busted and I decided to go fix it rather than wake up to a huge mud problem. 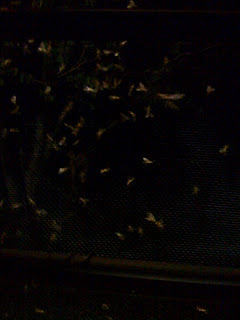 SO I went outside and fixed it in my pj's in the rain and noticed a swarm of bugs around our security light... then another... and then realized I was in the middle of the swarm. Thousands of flying ants swarmed me, I got inside and began the process of getting them out of my hair and clothing. Then I realized, they were attracted to light because they swarmed the bathroom light. I quickly went around the house and closed all the windows as the screens can only hold so much. Already there were a few hundred of these ants in the house. I checked on the kids, they were fine. My wife was woken up by my antics. It is odd to pull back a curtain and not be able to see out your window because of bugs covering the screen. The pic above is the best I could get without going outside. Our windows are louvred so it's hard to get a good shot from inside. My wife asks "what's going on?" "The craziest thing, there are flying ants everywhere." "oh yeah, they come out when it rains really heavy at the school too, usually hundreds of dead ants to sweep up in the morning." While I was marvelling at the swarm, my wife fell back asleep. It does take a few minutes to get back to sleep after your adrenaline gets moving, especially if you imagine yourself still covered in ants. I suppose the flooding rain forced the ants out of their earthy homes and they headed towards the light.